Parasitism is a type of symbiotic relationship, or long-term relationship between two species, where one member, the parasite, gains benefits that come at the expense of the host member. The word parasite comes from the Latin form of the Greek word παράσιτος (parasitos), meaning “one who eats at the table of another”. There are many types of parasitism, and parasites can belong to multiple classifications based on their size, characteristics, and relationship with the host. Obligate parasites are completely dependent on the host in order to complete their life cycle. Over time, they have evolved so that they can no longer exist without the existence of the host. This means that they usually will not cause serious harm to the host, as the parasites need the host to survive so that they can survive, unless the host’s death is needed for the transmission of the parasite. Obligate parasitism can be found in many different types of organisms, like plants, animals, fungi, bacteria, and viruses. Head lice are obligate parasites; if removed from the human scalp, they will soon die. Facultative parasites do not rely on the host in order to complete their life cycle; they can survive without the host, and only sometimes perform parasitic activities. Certain plants, fungi, animals, and microbes can be facultative parasites. A specific example is the nematode species Strongyloides stercoralis. This is a type of roundworm that can cause the disease strongyloidiasis when it infects humans, but it can also be found free-living. Ectoparasites are parasites that live on the outside of the host’s body, such as lice and ticks. Endoparasites, like nematodes and hookworms, live inside the host. Mesoparasites enter the host’s external openings, such as the outer ear or the cloaca. Macroparasites are parasites that are large enough to be seen with the naked eye. Microparasites are too small to be seen and must be viewed under a microscope. They are generally unicellular, such as protozoa. Necrotrophic parasites, also called parasitoids, essentially eat part of the host organism’s tissue until it dies from the loss of tissue or from nutrient loss. Biotrophic parasites do not do severe enough damage to kill their host; they need to keep the host alive because they can’t survive in a dead one. Monogenic parasites complete their life cycle in only one individual host. Digenetic parasites need more than one host to complete their life cycle. Plasmodium vivax, the protozoa that carries malaria, is digenetic. In order to complete its life cycle, it must be a parasite of both people and mosquitos. An epiparasite is a parasite that parasitizes another organism that is also a parasite. Epiparasites are also called hyperparasites or secondary parasites. One example would be a protozoan living in a flea that is living on a dog. Social parasites take advantage of social insects like ants, bees, and termites. They may use mimicry to invade the hive. Some bumblebees invade the hives of other species of bees, making that species raise the parasite’s young. One ant species, Tetramorium inquilinum, is a parasite that spends its entire life on the back of other species of ants, essentially making the host species its slaves. This parasite species has gained benefits such as food and transportation, but from this extreme form of parasitism the ants have evolved to be so weak that if they fall off their host, they will not be able to crawl back on, and die. Brood parasitism involves the raising of young. Bird species that practice brood parasitism, including cowbirds and cuckoos, lay their eggs in another species’ nest instead of building their own nests. This is a form of parasitism because the species who lay their eggs in other nests gain benefits (they don’t have to spend energy raising young) while the other species are harmed (they do have to use energy to raise young, and it is not their genetic material). Sometimes, the parasite species will even kick the other species’ eggs out of the nest, forcing the host to raise only the parasite’s young. Brood parasitism can also occur in fish. It is a type of kleptoparasitism, which involves directly or indirectly taking food from the host; in this case, food that could have gone toward the host species goes to the parasite species instead. This photograph shows brood parasitism. 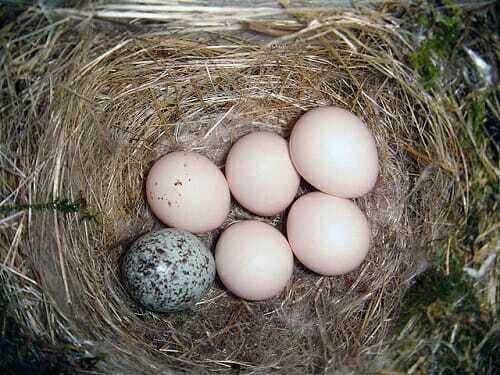 A brown-headed cowbird has laid its speckled egg in the nest of an Eastern phoebe. Over half of all organisms on Earth have a parasitic phase at some point in their life cycle, so there are many examples of parasitism besides the ones already mentioned and the ones listed below. Over 100 different types of organisms can parasitize humans including fungi, leeches, lice, ticks, mites, tapeworms, protozoa, viruses, and helminths. Helminths are worms that can live inside the intestines and can reach meters in length. They can cause a variety of problems such as malnutrition, jaundice, diarrhea, and even in severe cases, death. However, they can be treated with anti-parasitic medication. All infectious diseases, including the common cold, result from organisms that parasitize humans, such as viruses and bacteria. Many of the organisms that parasitize humans can also parasitize other mammals and birds. Aphids are small green insects that parasitize plants by eating their sap. Many types of fungi can also attack plants and can spoil wheat, fruit, and vegetables. Some plants are parasitic themselves. In angiosperms (flowering plants), parasitism has evolved at least 12 separate times, and 4100 species (about 1%) of angiosperms are parasitic. Parasitic plants have haustoria, which are modified roots which connect to the host plant’s xylem and/or phloem and drain it of water and nutrients. Some plants parasitize mycorrhizal fungi. This often happens when a plant species has evolved to no longer produce chlorophyll. Since it can no longer photosynthesize, it must gain nutrients for energy in other ways. Entomophagous parasites are insects that parasitize other insects. Usually these parasites attack larva, or young insects. Some insects deposit their eggs within the body of another insect species’ larva; when the eggs hatch, the parasitic young kill and eat the larva, gaining nutrients from it. Sometimes, the parent parasite paralyzes a host which is then fed on by the young. This occurs commonly in wasps such as Ampulex compressa, whose young eat paralyzed cockroaches that have been stung by the parent. Other wasps like Ropalidia romandi burrow into the abdomen of their host and then live there. They do not kill their host, but can change its appearance and behavior, and even make it sterile. Parasitism is extremely common in insects. In fact, almost all species of insects are attacked by at least one type of insect parasite. There are many organisms that parasitize fish, and sometimes different populations of the same species of fish living in the same region can be told apart because they have different characteristic parasites. Some parasites, such as copepods (small crustaceans), nematodes, and leeches. attach to the fish’s gills and live there. Cymothoa exigua is an isopod (another type of small crustacean) that parasitizes fish. It enters a fish’s mouth and eventually severs the fish’s tongue. Then, the isopod itself lives where the tongue was, and becomes the new tongue. The host fish can still eat, and will survive with an isopod in its mouth, but the isopod consumes a small amount of the fish’s blood and mucus while living there. Cleaner fish like bluestreak cleaner wrasses remove dead skin and parasites from other fish, including large predatory fish that would otherwise eat them. Fish parasites in can be a concern to human health when people eat foods that contain uncooked fish, such as sushi, because the parasites in these fish can also infect humans. However, infection through eating uncooked fish is relatively rare in the developed world, and some raw fish is frozen overnight to prevent infections. Obligate Parasite – A parasite that depends on the host in order to complete its life cycle. Facultative Parasite – A parasite that does not depend on a host can be free-living. Parasitoid – An insect parasite that ultimately kills its host. Protozoa – Single-celled eukaryotic organisms that can move around and prey on other organisms; some species are parasites. 1. Lice are an example of what kind of parasites? D is correct. Lice fall into all of these categories. They are big enough to be seen with the human eye, live on the outside surface of the host’s body, and having a host is necessary for them to complete their life cycle. 2. Which organism is an example of an endoparasite? D is correct. Hookworms are endoparasites because they live inside the host’s body. Mites, fleas, and lice are all ectoparasites; they live outside the body. 3. What are entomophagous parasites? D is correct. Entomophagous parasites are insects that parasitize other insects. Almost all species of insects are hosts for at least one species of insect parasite. Choice A does not have a name besides parasitic plants, choice B describes epiparasites, and choice C describes brood parasitism.